I've been sick for the past week with the Cold to End All Colds (or the flu?). By Saturday, I was getting desperate for anything to kill some time. Happily, I found a link to a personality test on E Tells Tales and spent five minutes answering seventy-two questions. Really, though, reading the description is a little like reading my diary. Take it and tell me what you think. I've taken this test many times. 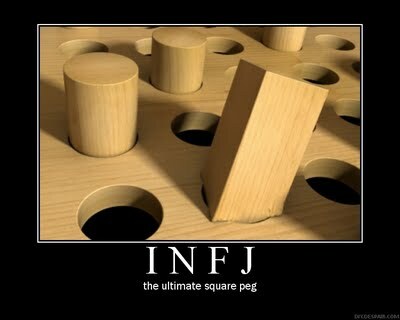 In the past, I considered myself somewhat of a Myers-Briggs Guru of sorts. The test you linked to is one of the better free options available. I am a INTP, the description is pretty spot on, though I am a soft I, so I don't identify with all of it. It's also one of the rarer types. Tony is an INFJ (like you) ... I guess I must like your kind!